Received an email from Ken Hendrickson, whose property abuts the Poplar Lake outlet and whose son-in-law's cabin adjoins the other side of the outlet. Ken claims neither he nor his son-in-law are responsible for building the illegal barricade to use as a foot bridge. See comment under Wednesday's post. If it was not built as a footbridge then someone who thinks they can control the lake level by placing a dam at the outlet must have built it. I would say someone on Poplar Lake has some explaining to do. An on going flash point between residents of Poplar Lake and Little Ollie Lake has for years been the small outlet between the two lakes. 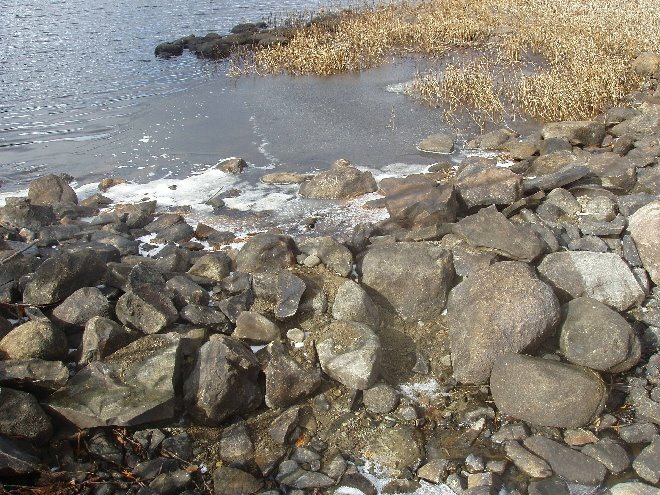 Poplar Lake residents have continually accused Little Ollie Lake residents of removing the rock between the two lakes thus increasing the flow and "draining" Poplar Lake. Little Ollie residents deny this, claiming the lake level of Poplar is up in the spring and goes down during the summer. How far the lake goes down during the summer depends on how much rain falls. This year Poplar is at the lowest level in memory and again some are claiming that more rocks were removed at the outlet; others simply blame it on this summer's drought. Under Minnesota State statue the removal or placement of rocks or fill in any body of water, including any stream, without a permit is strictly illegal. In other words nothing is to be placed in or taken out of the outlet between Poplar Lake and Little Ollie Lake, which would alter, in anyway, the natural flow between the two lakes regardless of the water level of Poplar Lake. The other day Jim Ross, a Little Ollie resident, notified Ted Young, from Poplar Creek Guesthouse B&B, that he (Jim) and his wife had just been over to this outlet and noticed that someone had built a rock between two lakes and that concrete had been pour into the rocks to re-enforce it. In response Mike Sherfy, owner of Rockwood Lodge and Young inspected the claim and sure enough a cement re-enforce rock barrier had been placed at the outlet. Both Young and his neighbors the Ross' had been through this outlet within the past month and are in agreement that prior to these earlier visits the dam was not there. According to Young, "when I visited the outlet about a month ago Poplar Lake's water level was so low that you could walk across the outlet on the rocks and there was very little water flowing between the two lakes. The outlet was like a rock side walk with lakes on either side. When I visited the outlet yesterday (October 23) it was obvious that rocks had been taken from this walkway and piled-up to form at dam and concrete dry mix had been pour in between the rocks." Young when on to state, "this barrier is for real unlike the ridiculous bogus claims spread by gossip before, by some, that residents of Little Ollie Lake regularly opened up the outlet to get their canoes into Poplar. We can get our canoes through the outlet without removing rocks, thank you. But we are certainly not going to carry our canoes over an illegal man- made concrete re-enforced barrier." The Minnesota DNR was alerted and an enforcement officer was sent-out to inspected the illegal dam. Further state action is pending. Stay tuned to this one folks! The saga of the outlet continues. Join one of this year's trail maintenance crews clearing the summer's accumulation of brush and downed trees along the Banadad Ski Trail. The Banadad, located along the Gunflint Trail in Northeast Minnesota is the BWCA's longest Ski Trail. Most of the trail runs through the BWCA, a Wilderness area, where the use of power equipment for maintenance is prohibited. As a result to get the trail open for skiing each year requires some 600-650 hours of hand labor. 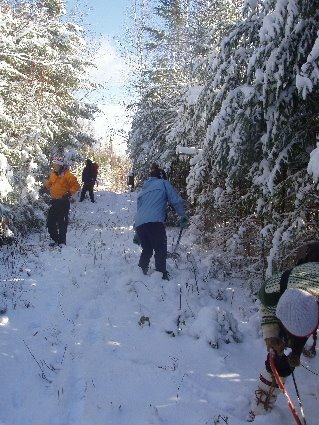 Your help is needed - Weekend Ski Trail Maintenance Trip scheduled October 27-29. Lodging, breakfasts and lunches, trail tools and supervision are provided on all trips. You provide work clothing, sleeping bags and your labor. A minimal fee is charged to cover cost of food (breakfast and lunches, dinner on your own) and two nights lodging. Cash donations also accepted. Check should be made payable to the Banadad Ski Trail Committee. Sign-up now for this year's trips! Call 800-322-8327 to reserve your space on the trail crew. Shivering in a tree stand? Tramping through the cold-damp woods in a red uniform. No way! Instead enjoy great accommodations, great food, and other exciting activities in Minnesota's North. Dear Camp is for hunting widows and friends looking for a different weekend getaway during November. Here is a sampling of the activities included in a Dear Camp weekend -an evening of northwoods legends, myths, stories, and wine by a crackling fire, breakfasts, a massage, a fashion show, lunch while shopping in Grand Marais, guided outdoor tours, poker night, wine and wild game dinner, Sunday brunch and more! Dear Camps are scheduled November 2-5, November 9-12 and November 16-19: andincludes 3-night lodging in your chose of Gunflint Trail, Grand Marais or Northshore lodging, activities and most meals. The price for the three-night weekend is $299/per person plus tax based on double occupancy. For more information go to Dear Camp . To reserve you spot at Dear Camp call 888-363-2267- Ask to stay on the Gunflint Trail at Poplar Creek Guesthouse Bed and Breakfast (listed on Dear Camp web site as Boundary Country B&B) when making a reservation. The Gunflint Trail's first snow started to fall Thursday. As of today there is now six inches of snow on the ground. More snow is predicted over the next three days. If you are planning to ski bring your rock skis. Look for temperatures in the 20-37 degree range. 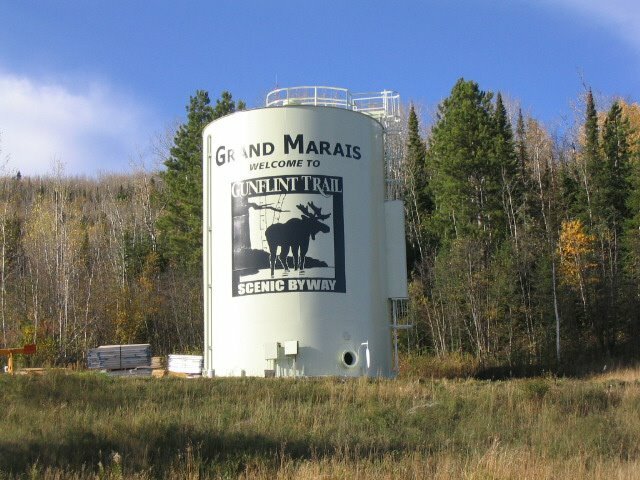 Next time you headout up the hill out of Grand Marais along the Gunflint you will be greeted by the newly repainted Grand Marais' water tower welcoming you to the GunflintTrail. The new Gunflint Trail Scenic Byways logo on the tower came about as a cooperative project between the Grand Marais City Council and the Gunflint Trail Scenic Byways Committee. The Byway's Committee committed some $8000 towards repainting and refurbishing the water tower. Boundary Country Trekking, which own and operate Poplar Creek Guesthouse B&B, grooms and maintains the 45 kilometer Banadad and Adjoining Ski Trails. 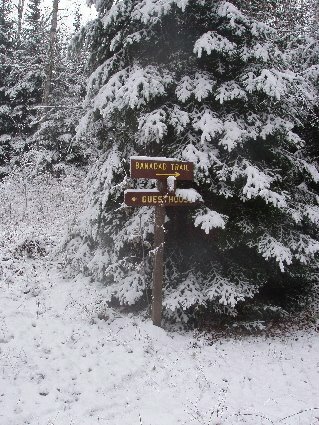 The Banadad is the BWCA's longest tracked ski trail. The Trail is in the center of the 180-kilometer Gunflint Nordic Trail System. Getting the Banadad open each year for skiing require some 450-500 hours of hand labor. Volunteers recruited and supervised by Boundary Country Trekking contribute most of this work. This year's maintenance began September 29 with three people, Barbara and John Bottger (Hungry Jack Lake) and Ted Young (Poplar Creek Guesthouse). The crew drove out the Moose trail by truck to the Croft Yurt then walked in a mile and one- half to the sagging Banadad Bridge. The decking on the bridge was removed and the rotting beams reinforced and the decking replace. After completing the bridge, the crew widened the approach to the bridge and cut out the over hanging brush along the way back to the truck. It drizzled all day. The work crew encountered three parties of moose hunters along the Moose Trail including one group that had set-up their hunting camp just off the trail and near the Bedew Creek. While working on the bridge two more moose hunters came though the Rush- Banadad Portage. The next day, September 30, another crew of volunteers- Cindy Tiffany and Margit Jamieson (Gunflint Lake); John Bottger; Mike Nelson and Bryan Straniero Adventuresome Christians' staff and Ted Young tackle the eastern end of the trail. This crew hiked-in from the Poplar Lake Public Landing along the one and one-half mile maintenance access trail- the old Winchell Lake fire trail build by the CCC in the 1930's. Arriving at the Banadad five of the crewmembers headed west towards the Old Logging Camp cutting brushing as they went. This crew estimate they cleared and widened, at least, another mile of the Trail. Young walked back east surveying the trail conditions between the access trail to the eastern trailhead and Poplar Creek Guesthouse a distance of 4 1/2 miles. While there were a few small trees that were cut, the rest of this section was in fairly good condition. Two moose hunters were encountered along the way. It was another gray day.